There is nothing that detracts from an office atmosphere more than a messy, disorganized desk. Using one of our desktop organizers is a fabulous way to put clutter in its place. Our organizing products make filing papers and other desktop items a pleasure as they add a touch of style to your office space. With a variety of finishes such as wood, steel, laminate, and leather look, finding the right one is easy. 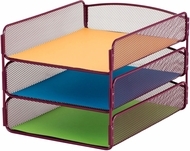 Our desktop organizers come in styles with adjustable shelves, sliding trays, combination racks, and baskets. There is a model for every office need.